This has been a great study! The life of a Christian and the life style and ways that would please a righteous God starts with a prayer life that gains a relationship with the Father. Prayer is connection with God, communicating with Him daily, getting to know Him through prayer. My life has changed because I truly believe in praying to the Father every chance I get; while riding in my car or just setting in meditation. When you pray your faith grows into trust. The situation that has come into my life has built up my faith in God. I hate these times, but I know if I didn’t have situations, trials, or tribulation then I would not trust God as I do today. These times cause me to pray more because I need God to help me. But not only through bad times, but good times too. My good time has brought praises to my heart and I just worship Him in praise with crying tears. Oh what a blessed time! I have learn that the bad times can too, because then you can get closer to God through prayer and communicating through the Holy Spirit, whom I have learn to depend on. Sometimes I set and just meditate and the Holy Spirit would bring the bad times to my remembrance of how God brought me through. He has let me know that I have not been alone. All the Prayer Focus came from the book by Sarah Young “Jesus Calling.” This book speaks to my heart from the Holy Spirit. I am so grateful that God blesses me with a daily quiet time with Him, so I can grow more spiritually and trust Him in my heart more. Personally, I get so down in my spirit, but God’s Holy Spirit remind me to trust in God always. A life that trusts God is a life of prayer! Having faith, if only as a mustard seed brings a godly life; but it do take more to live a godly life to God Almighty. We surely need communication with the Father, so He can talk with Him and His Holy Spirit for guidance; I read this once, guidance means “God U and I dance,” what a beautiful interpretation of this word! Imagine you and God so close that it only takes a whisper to Him. When I was a teenager I would whisper in my dance partner’s ear thing I didn’t want others to hear. That was so sweet then! This is how it is with God and you in meditation. When we are indwelt by the Holy Spirit we are prompted in a whisper in our hearts to God. And, this is done through meditation in God’s Word. The Holy Spirit is our Comforter! He comforts us in this world today. He helps us live a godly life, so we can please God daily. Remember God’s Spirit always works through His Word. Meditation on God’s Word daily is a godly habit to live by. The leaders of the early church relied on the Holy Spirit to give them this kind of specific personal guidance, and we are wise to do likewise. In studying the whole Bible you can find that God’s nature and characteristic is generosity! He has promised us this nature too. We have God’s life, nature, and ability in us to do what pleases God and to live a godly life. This book touch my heart so much, especially reading it during the Passover Week; I saw so much more then than I have ever saw in this book concerning the Atonement and Christ as our High Priest after the order of Melchizedek. My prayer is that every Christian read this book in the fullness. I felt lead to give a summer of this book as a conclusion for our study. Although some include the Book of Hebrews among the apostle Paul’s writings, the certain identity of the author remains an enigma. Missing is Paul’s customary salutation common to his other works. In addition, the suggestion that the writer of this epistle relied upon knowledge and information provided by others who were actual eye-witnesses of Christ Jesus (2:3) makes Pauline authorship doubtful. Some attribute Luke as its writer; others suggest Hebrews may have been written by Apollos, Barnabas, Silas, Philip, or Aquila and Priscilla. Regardless of the human hand that held the pen, the Holy Spirit of God is the divine author of all Scripture (2 Timothy 3:16); therefore, Hebrews speaks with the same canonical authority as the other sixty-five books of the Bible. Hebrews 2:3: "How shall we escape if we ignore such a great salvation…"
Hebrews 4:14-16: "Therefore, since we have a great high priest who has gone through the heavens, Jesus the Son of God, let us hold firmly to the faith we profess. For we do not have a high priest who is unable to sympathize with our weaknesses, but we have one who has been tempted in every way, just as we are—yet was without sin. Let us then approach the throne of grace with confidence, so that we may receive mercy and find grace to help us in our time of need." Hebrews 12:1-2: "Therefore, since we are surrounded by such a great cloud of witnesses, let us throw off everything that hinders and the sin that so easily entangles, and let us run with perseverance the race marked out for us. Let us fix our eyes on Jesus, the author and perfecter of our faith, who for the joy set before him endured the cross, scorning its shame, and sat down at the right hand of the throne of God." The writer of Hebrews continually makes mention of the superiority of Christ in both His personage and in His ministering work. In the writings of the Old Testament, we understand the rituals and ceremonies of Judaism symbolically pointed to the coming of Messiah. In other words, the rites of Judaism were but shadows of things to come. Hebrews tells us that Christ Jesus is better than anything mere religion has to offer. All the pomp and circumstances of religion pales in comparison to the person, work, and ministry of Christ Jesus! It is the superiority of our Lord Jesus, then, that remains the theme of this eloquently written letter. Practical Application: Rich in foundational Christian doctrine, the Epistle to the Hebrews also gives us encouraging examples of God’s "faith heroes" who persevered in spite of great difficulties and adverse circumstances (Hebrews 11). These members of God’s Hall of Faith provide overwhelming evidence as to the unconditional surety and absolute reliability of God. Likewise, we can maintain perfect confidence in God’s rich promises, regardless of our circumstances, by meditating upon the rock-solid faithfulness of God’s workings in the lives of His Old Testament saints. The writer of Hebrews gives ample encouragement to believers, but there are five solemn warnings we must heed. There is the danger of neglect (Hebrews 2:1-4), the danger of unbelief (Hebrews 3:7–4:13), the danger of spiritual immaturity (Hebrews 5:11–6:20), the danger of failing to endure (Hebrews 10:26-39), and the inherent danger of refusing God (Hebrews 12:25-29). And so we find in this crowning masterpiece a great wealth of doctrine, a refreshing spring of encouragement, and a source of sound, practical warnings against slothfulness in our Christian walk. But there is still more in Hebrews we find a magnificently rendered portrait of our Lord Jesus Christ—the Author and Finisher of our great salvation (Hebrews 12:2). It has been very rewarding to me during this study, because I have been in a trial through it. Prayer has become more and more a needful tool. When God want you to trust Him more, things will begin to happen. I have been praying more, trusting God more, meditating more on His Word, and yes, obeying Him, depending more on the Holy Spirit, giving God’ His time, giving others more compassion, and in this trial I have had to forgive those who have wronged me too. 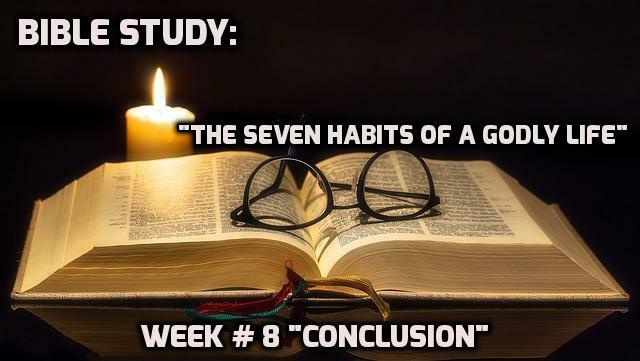 God require this of us if we truly and sincerely want to live the Seven Habits of a godly life before Him, and others. Glory Hallelujah; Thank You Jesus, Praise Your holy Name, You are worthy of all praises, glory, and honor. I worship You, Lord! Lord, thank You for caring so much about us. We put all our fears and worries in Your hands and receive Your strength. Thank You for giving us a prayerful life. AMEN. Lord, I choose to trust You in every situation, though I may feel insecure or fearful. Help me/us to obey You completely. Lord God, may the harvest You’re cultivating right now grow and flourish, even if I don’t see it in this lifetime. Please help us to trust You with our faith totally in You. AMEN. Lord, I want to know You better. Teach me to hear Your voice and take joy in listening to Your heart. I desire to set aside time to spend with You daily. Lord, thank You for the wonderful things You’re doing for me behind the scenes. You are an awesome God, who reign from heaven above with wisdom, power, and love, and I want to experience that as I set in Your presence. Lord God, help us to be willing to heed Your instruction. We have much to give and much to learn from the Holy Spirit. Give us an opportunity each day to come into Your presence. Grant that to us all in Jesus’ name. AMEN. Jesus, my Lord and Savior, help us to become obedient and be like a child so we might enter into You Kingdom. As we study these lessons help us to be obedient to Your Word we study in these lessons. Jesus, come what may, help us to never leave Your love. Give us the child-like trust to keep ourselves in Your love. Obedience is better than all sacrifices as we read in Your Word. Father, we are praying for all Prayer Warriors, and others in our circle of family or friends to choose to live in obedience to the Word…Help them be those who faithfully obey You. May they/we desire to obey You and what You ask of us in Your Word as an expression of our love for Jesus. Your Word says we are slaves to what we obey, so I ask You to help them/me become slaves to obedience, the obedience that leads to right living and holiness. (Deuteronomy 28:11a; John 14:15; Romans 6:16, 18, 19b) Open our eyes to see the wonderful truths of the Bible, and teach us to choose the way of truth, setting our hearts to live as You say we should live. May we be eager to learn what You want us to do, for You have set our hearts free! (Psalm 119:18, 30, 32) Teach us to follow Your commands; help us to understand them. Give us the desire to obey You with all our hearts. Take away our foolish desires. (Psalm 119:33–34, 37) May we love You and follow Your commands, for they’ll not too difficult. In every weakness, Christ, who was obedient even to death, is their strength! And You are faithful to bring us through every temptation;(1 John 5:2; Philippians 4:13; 2:8b; 1 Corinthians 10:13). In Jesus’ name we pray, amen. Lord, how freely You’re given everything to me-to Your people. Use us to lavish Your good gifts on others today. Lord, thank You for the incredible blessings You’ve lavished on us. Make us a continuous blessing to Your people. AMEN. Lord God, we praise You for Your grace and mercy today. Thank You for Your love. It is because of You we can live a forgiven life. This study has bless our hearts and we glorify You. As You have taught us, please now, Lord help us to live this for Your glory. AMEN.